High capacity 2400 mAh battery for the iPAQ hw6500 series PDA. The extended run time with this battery is a must for heavy GPS, WiFi or Bluetooth users. The high capacity battery does increase the profile of the iPAQ however a dedicated battery cover is also included. 100% OEM compatible battery. 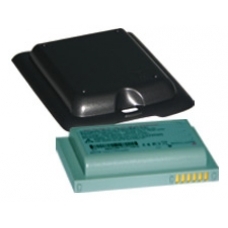 Suitable aftermarket replacement for the following HP battery part number HSTNH-D06B-HC, FA835AA#AC3. * Equivalent to original HP part no. 382858-001, 390267-001. * 3.7v 2400 mAh Capacity.